The Regiment, the Dreaded-D, the Teams - these are not just military units, these are legends. Known for their cunning, their audacity and their outright deadlines, these special operations forces, the high-speed, low-drag door kickers, fire and imagination and instil fear. Covert Forces describes some of the premier special operations forces in the world, including Australia's SASR, Canada's JTF-2, the US' Delta Force and SEALs, and the United Kingdom's SAS and SBS. 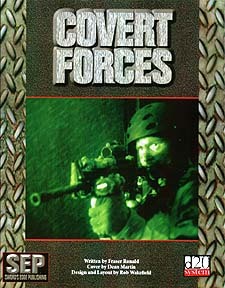 With concise descriptions of a variety of other SOFs from around the world, new feats, rules for "fluid situations" like interrogation and aerial insertions, Covert Forces describes the world of spec ops for players and game masters alike.